As the summer of 1948 uneventfully passed through July and entered August, Congressmen and Senators eagerly awaited a much needed respite to escape the sweltering heat characteristic of a Washington summer. As they lightheartedly made calls to reserve flights and rooms at beach-front resorts to enjoy with their families, Congressman Richard Nixon was busy in his efforts to save the reputation of the Committee on Un-American Activities, while concurrently exposing an espionage attempt made by what was perceived to be one of his most reputable contemporaries, Alger Hiss. The Committee’s investigation to expose a Communist spy ring in Washington led them to Whittaker Chambers, former Communist functionary in the 1930s who left the party and eventually became a well-respected and venerable senior editor for Time Magazine. On August 3, Chambers – in his testimony – described his involvement with Communism, his growing disillusionment with Stalinism, and his eventual break with the party. As he summed up his previous Communist activities, Chambers emphasized that his group’s primary objective was to infiltrate the government and that among them was Hiss. Hiss, boasting a repertoire that included attending Harvard Law School, serving as secretary to Supreme Court Justice Oliver Holmes, adviser to President Roosevelt at the Yalta Conference, and major architect of the United Nations, immediately requested an audience with the Committee to give his own testimony and deny all of Chambers’ allegations. The Committee acquiesced and on August 5, Hiss – who in stark contrast to Chambers, possessed perfect poise, smooth disposition, and elegant mannerisms – gave a convincing denial of the charges against him, denied ever even knowing Chambers, and promptly followed his argument by supportive commiserations from his friends on the damage to his reputation. That same morning, President Truman blatantly condemned the Committee’s investigation as a “red herring” that only served to undermine public confidence in the government. Truman then threw his political weight to oppose the Committee’s efforts. This presidential roadblock coupled with Hiss’s stirring testimony scared the committee into considering dropping the investigation for fear of irreparably injuring their names right before the election. RN alone held his ground and argued in favor of pursuing the case further. He was convinced that Hiss had committed perjury and that the committee had more to gain than they had left to lose. On August 7, RN and a few others questioned Chambers thoroughly and upon review of his answers, became convinced that only a man extremely close and personal to Hiss could know such intimate details of his life. A few days later, after RN convinced John Foster Dulles, who heavily supported Hiss, and Bert Andrews, an outspoken Pulitzer-prize writer against the committee of Hiss’s guilt, Hiss was brought back once again for an executive session. This time the committee aimed to stamp out the discrepancies between the two testimonies. Hiss related a brief encounter many years ago with a one George Crosley, the verity of which was unknown. RN, however, was not convinced. The pressure soon broke Hiss and the committee was exposed to his haphazardly constructed tale. Ironically, their skepticism regarding his story originated from a minute predilection Chambers had recalled concerning Hiss’s hobbies: ornithology, the study of birds. Chambers could not possibly have fabricated such a trivial, and yet unique, detail of someone’s life had it not been an exhaustive relationship. RN felt that a public confrontation must be set up between Chambers and Hiss immediately to prevent the latter from weaving any more elaborate lies. The meeting was scheduled for August 17 at the Commodore Hotel in New York. After a lengthy period during which Hiss evaded direct answers and manipulated questions with misleading interruptions, Hiss confidently identified Chambers as Crosley. A follow up confrontation occurred one week later in the packed Caucus Room of the Old House Office Building with witnesses anticipating a heart-wrenching and suspense-packed interrogation. Hiss left that Caucus Room that day deterred and degraded as the Committee proved an automobile he had sold in 1936 went through the hands of an intermediary and straight to a man with a record of being a Communist organizer. It corroborated Chamber’s detailed testimony precisely. Several months later, Hiss sued Chambers, accusing him of committing libel. In the battle that ensued, Chambers realized Hiss was out to destroy him and responded accordingly. RN, along with the rational and methodical Committee special investigator Robert Stripling, visited Chambers at his home where they learned that Chambers had collected documents and microfilms when he left the Communist party as life insurance against blackmail attempts for leaving. RN and Stripling quickly had all the materials subpoenaed. The evidence accumulated was devastating for Hiss. Hiss was indicted, sentenced, and eventually fell into obscurity. Herbert Hoover congratulated Nixon on his conviction, praising him for his “patience and persistence,” adding that “the stream of treason” in the government had finally been exposed. 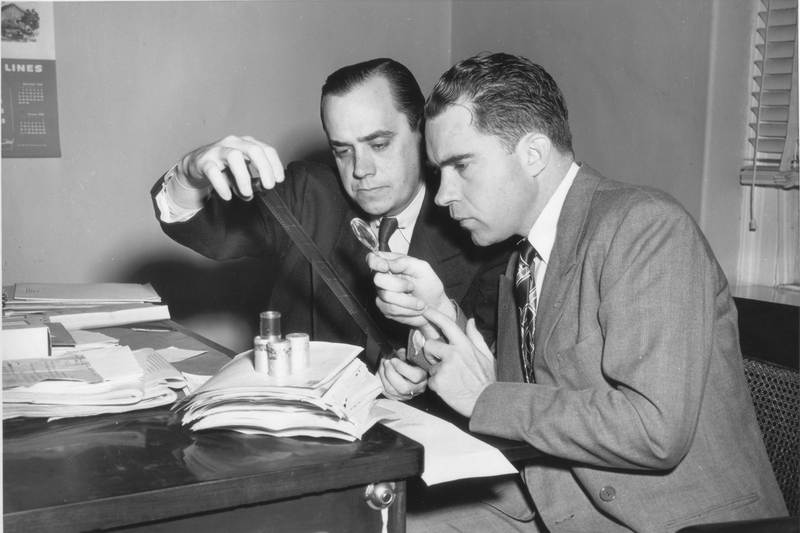 Photo: RN studies microfilm with HUAC Special Investigator Robert Stripling.